Vincennes, IN – The United States Mint (Mint) held a ceremony today near the Wabash River to officially launch the George Rogers Clark National Historical Park quarter, the 40th release in the America the Beautiful Quarters® Program and the final coin of 2017. 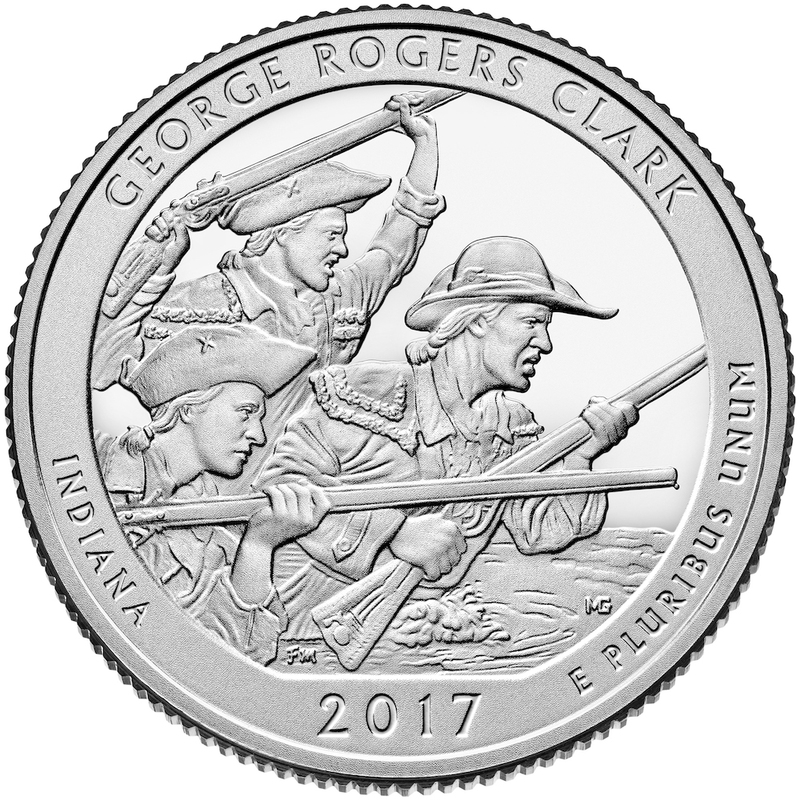 The reverse (tails side) design featured on this latest quarter depicts George Rogers Clark leading his men through the flooded plains approaching Fort Sackville. Motl shared the stage with a host of speakers including Park Superintendent Frank Doughman and City Council Member Dan Ravellette. Regional Director Tony Goben, District Director Brenda Goff and District Director Carol Jones spoke on behalf of U.S. Senators Joe Donnelly and Todd Young, and U.S. Representative Larry Bucshon, respectively. Additional highlights included performances by the George Rogers Clark Fife and Drum Corps and the Vogel Elementary School Choir, and an appearance by United States Mint Artistic Infusion Program artist Frank Morris, who designed the quarter’s reverse. The Mint’s traditional coin exchange of newly-minted $10 quarter rolls was held after the ceremony. Collectors who could not attend the event may purchase product options with the new quarter through the Mint’s online catalog at www.catalog.usmint.gov or by calling 1-800-USA-MINT (872-6468). Launched in 2009, the America the Beautiful Quarters Program, which was authorized by Public Law 110-456, the America’s Beautiful National Parks Quarter Dollar Coin Act of 2008 (Act), is a 12-year program that honors 56 national parks and other national sites. Each year until 2020, the public will see five new national sites depicted on the reverses of the America the Beautiful Quarters coins. A final coin will be released in 2021. In accordance with the Act, the Mint is issuing these quarters in the order in which each site was first established as a national site.